[Newton] said, "If I have seen further than others, it is because I've stood on the shoulders of giants." These days we stand on each other's feet! This will read a text document from its standard input and produce a list of misspelled words. It works by transforming all nonalphabetic characters into new lines, folding uppercase letters to lowercase, sorting the resultant list of words, removing duplicates, and finally printing those words that don't appear in the system dictionary. By fixing the system dictionary's location, which has moved over the years, I successfully tested the pipeline on modern FreeBSD and Linux systems. Impressively, on one of those increasingly common multiprocessor machines, the pipeline used 1.25 of the two available processors—a feat, even by modern standards. However, when I first saw the pipeline, portability and multiprocessor use weren't on my radar screen. What impressed me was how five straightforward commands, running on a relatively simple system and supporting a few powerful abstractions could achieve so much. I hoped life in computer science would be a series of such revelations, but I was in for disappointment. Things appeared to be going downhill from then on. I saw systems become increasingly complex, the tools that first impressed me fall into disuse, and the concept of reuse preached more than practiced. A "hello world" program in the then shiny new X Window System or Microsoft Windows was a 100-line affair. I felt our profession had hit a new low when I realized that a particularly successful ERP (enterprise resource planning) system used a proprietary in-house developed database and programming language. It seemed Hamming was right. Yet, progress moves in surprising ways. Nowadays, I'm proud of our achievements and optimistic about our future. 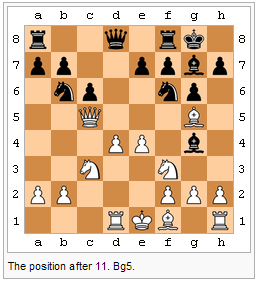 Look at figure 1, depicting a position of what became known as the Game of the Century: a chess game played between Donald Byrne and 13-year old Bobby Fischer on 17 October 1956. Although the game was remarkable, so is the ecosystem behind the picture. | The position after 11. Bg5. Figure 1. A chess board diagram and its layout description. The picture on the left comes from the Wikipedia article on the game (http://en.wikipedia.org/wiki/The_Game_of_the_Century_(chess), as of 21 October 2006). To create it, one of the article's 65 contributors wrote the layout appearing on the figure's right, using a readable and concise domain-specific mini-language. Despite what you might think, this chessboard description language isn't an inherent part of MediaWiki—Wikipedia's engine. Instead, it's a MediaWiki template: a parameterized, reusable formatting element. About a dozen people wrote this particular template, using MediaWiki's low-level constructs, such as tables and images. Digging deeper, we'll find that MediaWiki consists of about 175,000 lines of PHP (hypertext preprocessor) code using the MySQL relational database engine. A rough count of C/C++ source code files in the PHP and MySQL distributions gives us 740,000 and 1.8 million lines, respectively. And underneath, we'll find many base libraries on which PHP depends, the Apache and Squid server software, and a multimillion-line-large GNU/Linux distribution. In all, we see a tremendously complex system that lets hundreds of thousands contributors cooperatively edit two million pages—and still manages to serve more than 2000 requests each second. We must be doing something right. Keeping Wikipedia's components freely available has surely helped, but there's more than that in our recent successes. One important factor is that we've (almost) sorted out the technology for reuse. Huge organized archives, pioneered by the Comprehensive TeX Archive Network (CTAN) and popularized by Perl's Comprehensive Perl Archinive Network (CPAN), lets us publish and locate useful components. The package management mechanisms of many modern operating systems have simplified the installation and maintenance of disparate components and their intricate dependencies. Programming languages now offer robust namespace management mechanisms to isolate the interactions between components. Shared libraries have matured providing us with vital savings in memory consumption: on a lightly loaded system, I recently calculated that shared libraries saved 97 percent of the memory space that we'd need without them. Widely used proprietary offerings, such as Microsoft's .NET and the Java Platform Enterprise Edition, have also helped code reuse, by integrating into their libraries everything but the kitchen sink. In all, the factors determining our return on investment from the components we reuse have moved in the right direction: modern components, like the chess description language, offer more and demand less. A second important factor of our successes is the emergence of new types of collaboration. Version-control systems, bug-management databases, mailing lists, and wikis form the glue of modern large development teams. At the same time, code repositories, RSS feeds, automatic software update systems, and more mailing lists bring together component producers and consumers. Claiming that the Internet has revolutionalized software development might sound farfetched, but we've got to remember that 20 years ago, systems of the size we've seen were developed only by NASA and large defense contractors, not volunteers working in their spare time. Like many of my generation, one of my early sources of inspiration, predating the Unix pipeline, was Star Trek's USS Enterprise. I marveled its intricate technology but always wondered how it was built and maintained, especially when pieces of it got torn apart in battles. Clearly, the development model that gave us the Doric beauty of Unix and its tools couldn't be extended to cover the Enterprise's baroque complexity. I used to think that I would have to take that particular aspect of the Star Trek offering with a pinch of salt. Now I see that we computing professionals are developing an ecosystem where large, intricate systems can grow organically. And this is another truly inspiring idea.